LOWELL, MA – Now there’s a brand new day to mark on the November calendar, at least for residents of Staten Island. 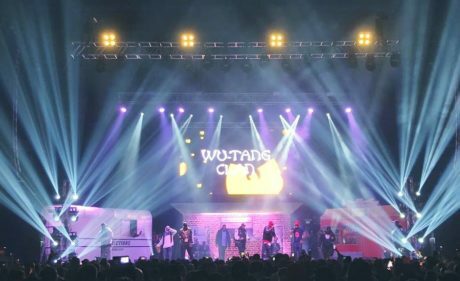 On Friday November 9, officials in the New York City borough announced that henceforth that day will be forever observed on the island as “Wu-Tang Clan Day.” It was a fitting honor for the local group from the Park Hill neighborhood that revolutionized rap 25 years ago on November 9, 1993, with their debut album Enter the Wu-Tang. 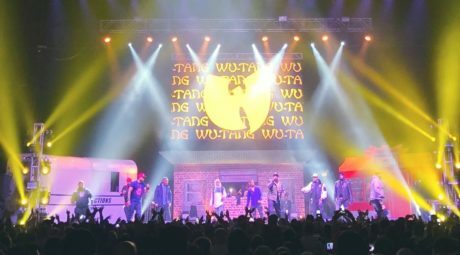 A week earlier, the Wu-Tang Clan, which Rolling Stone once declared, “the best rap group ever,” celebrated their 25th anniversary with a sold-out concert 240 miles to the north of Staten Island at the Tsongas Center in Lowell, MA. Balancing the dynamism of the iconic group’s sound with a contemplative reflection that fit the quarter-century retrospective, the concert evoked a wide range of emotions. Reflecting it all visually was a diverse Freddy Thompson lighting design that featured over 60 CHAUVET Professional fixtures, supplied by JDI Productions, Inc.
Thompson used 16 Rogue R3 Wash, 16 Maverick MK1 Hybrid, 12 Rogue R2 Wash, 16 Legend 230SR Beam, and 4 STRIKE 4 fixtures to create his looks on stage and over the crowd. The Rogue R3 Wash fixtures were flown on the downstage truss and were used to light the group and their set pieces. Also on the downstage truss were the STRIKE 4 units, which provided audience lighting. On the upstage truss, Thompson flew eight of his Maverick MK1 Hybrids and an equal number of Rogue R2 Washes. 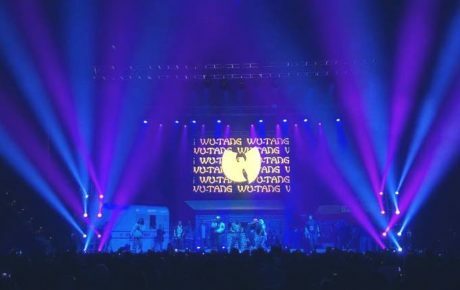 The remaining Maverick and Rogue R2 units, along with the Legend fixtures, were positioned on 12’ truss towers stage left and right. And just like another tightly knit group from Staten Island, the result of their close collaboration was nothing short of spectacular.